Chamomile is one of the most popular and widely used herbs in the world. Even if you’re not into herbal medicine you’ve probably had chamomile tea, and you must know about its calming properties. It has been used medicinally for thousands of years across many parts of Europe, where it enjoys a status similar to that of ginseng in Asia. As part of the Asteraceae family, the plant is related to daisies: its flower has a delicate, pretty white petal with a cone-shaped yellow centre. Chamomile gets its name from the Greek for “earth apple,” and proudly features an aroma reminiscent of fresh apples. Matricaria chamomilla is sometimes called German chamomile. It should not be confused with Roman chamomile (Chamaemelum nobile), which is not typically used for medicinal purposes. Chamomile is much more than just an herbal tea that helps put you to sleep: it’s a popular treatment for numerous ailments, including anxiety, indigestion, skin infections, inflammation, eczema, infant colic, teething pain, and diaper rash. Chamomile cream can also be used for treating eczema. Its essential oil contains an ingredient called bisabolol, which has anti-inflammatory, antibacterial, antifungal, and ulcer-protective properties. The flavonoids in chamomile also act as a powerful anti-inflammatory. Above all, chamomile has a reputation for being a mild relaxant. It’s the go-to anxiety remedy, particularly when symptoms include sleeplessness and indigestion. 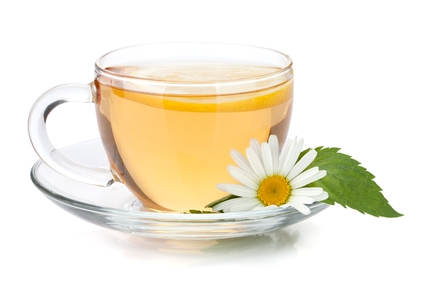 There is evidence that chamomile contains compounds that relax the nervous system.